Welcome to my life . . . . 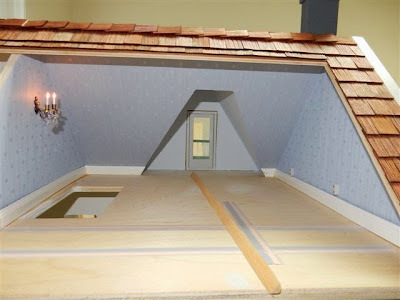 This is a blog about my passion: dollhouses and miniatures. This particular blog was started to follow my miniature dream: to create a Victorian Mansion. But work on my Mansion is slow. Very slow. Sloth slow. Ice Age glacier movement slow. Why? Because I am easily distracted by other personal miniature projects (I have 50+ roomboxes and 15 dollhouses in various stages of incompletion) and because I work for a miniature shop and am often up to my elbows in miniature projects that aren't mine! So, I thought, some artists work in a particular medium (woods, watercolors, clay, oils, etc. ), I work in progress . . . .
After checking the continuity of the power and disconnecting the switch from the tapewire, I finally determined that the issue was a short either in the wire or in a fixture. But I had no idea how to figure out which fixture or where in the wire the short was located. Luckily I have become good friends with Carl of Creative Reproductions 2 Scale (I'm sure many of you have seen his real working fan light). So after I reinstalled the switch to the tapewire under the house, I called Carl and picked his brain! He instructed me to remove all the bulbs in the fixtures on the 3rd floor. Then he told me how to use his tester to check to see if the short was in the wires. No short in the wires! And, my CirKit tester was now lighting when I tested (before it was dimly lighting before immediately turning off)! This is progress! So to determine which fixture had the short, I reinstalled the bulbs, one bulb at a time, one fixture at a time, across the 3rd floor. When I hit the bulb that would make them all go back out: that's the fixture that has the short. Simple. Brilliant! Each bulb lit as I reinstalled them! I am thankful that no wallpapers, floorings, or trims had to be ripped out or replaced! I kept testing the house all day long and every single time it lit up, all three levels! I sometimes even left them on for minutes just so I could stare at how pretty it all looks . . .
3rd floor lights are working! So, Harborside Mansion came together beautifully! After some frustration with the warped baseboard and crown moldings from England, and a few hiccups with the arch (new arch did not fit the opening we made and the hole had to be enlarged), and momentary heart failure when the stairs didn't fit correctly (spent an hour or so sanding and chiseling away at stair hole opening), the day is finally here when the customer is coming to pick up the house! Colors and papers the customer picked out are lovely, archway is amazing, floors are stunning (especially with the stairs!) and all that is left to do is to cut crown molding for the dining room and bathroom! I go in to work an hour early to cut those pieces and glue them in so it's all ready for the customer who will arrive just before lunch. She will finalize some baseboard decisions in the library and kitchen, leave to have lunch, and while she is at lunch I will cut the baseboards and install them. I love having a plan! Living room looking great with lights on and stairs in place! Arch really adds a nice architectural detail to this conservatory! Until that plan blows up in my face. Arrive at work early and realize the dining room and bathroom are in the bay part of the house. 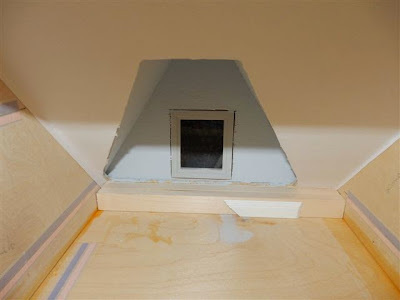 Baseboard was cut at a 22.5 degree angle for these rooms and did not fit exactly perfect, but with a tiny bit of spackle and paint it blends beautifully. But the crown is thicker and 22.5 degrees isn't working at all! I cut a dozen pieces without one fitting quite right. I'm pulling my hair out in frustration. Dad arrives and offers his sage advice: it's not a 22.5 degree angle; it's a 30 degree angle. My hero: Problem solved! He starts to cut me pieces as the customer arrives. While showing the customer her house we turn on all the lights. The house lights up beautifully (as it had in the weeks prior as I was working on it, including that morning when I turned it on to show another customer how pretty the sconces are in the attic). Then after a brief moment, the lights all flicker and act strange before going out. Transformer overloaded? I count the bulbs; no, we are at 49 bulbs and 12 outlets for future lamps and the transformer is rated for 64 bulbs so we should be fine. Long story short: lights on first and second level eventually come back on, but third floor is still dark. Attic Bedroom all finished except now light is not working. All the pretty sconces will be very dramatic with the mirrors the customer has for between them. Wires going from the back of the switches (located on the exterior foundation) to the runs of each level. But I'm not sure what the red wires are leading from the switches to the tapewire. Are they rated for the proper amps needed for a dollhouse to operate? Yet, it all worked in the weeks leading up to the customer coming to get the house. I am hoping that if I replace or repair the red wire for the 3rd floor (notice it is spliced in the middle there for some reason - wonder what that is all about because it was like that - I haven't repaired anything yet) it will all work again. Right now when I test the tapewire labeled 3rd floor, the tester glows very faintly before clicking off (like a short maybe?) so I know there is power there, but it's weak and turns off quickly for some reason. 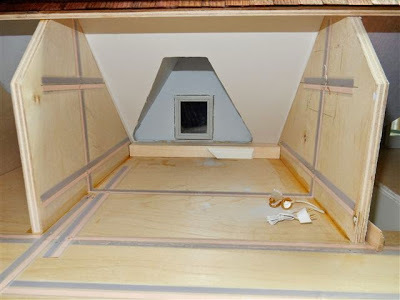 Wiring under the house: I'm hoping the problem is here because I don't want to rip up wallpapers and floors! 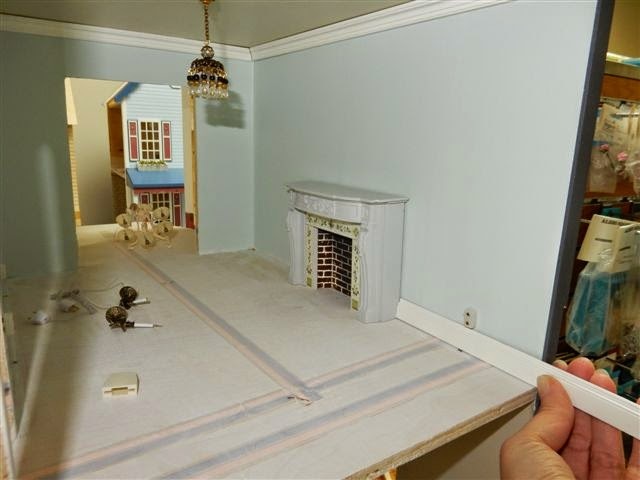 I am trying hard not to cry (as I'm sure the customer is too as it is heartbreaking to not get her dollhouse like she thought she was -- but I can't send her home with a house that doesn't light on the 3rd floor!). And I am scared to death that the wiring issue will involve ripping up wallpapers or floors to find the source of the trouble: something I do not want to do seeing as how pretty everything is right now (plus all the time it would take). 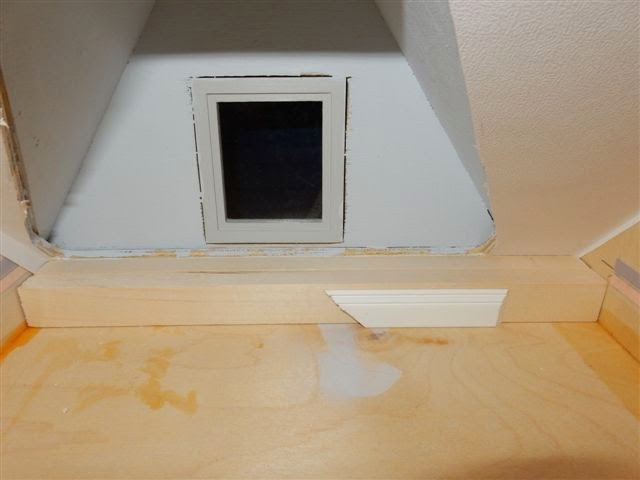 If anyone has any ideas I am open for suggestions, because I am stumped and only have 2 more days to find the problem before the customer returns to get her house! Between snow, ice, and sickness that was shared amongst various family members, I am woefully behind schedule on the dollhouses! But I am working on turning that around now that (as of today) all the children are back at school (still sniffling and coughing, but no longer running a fever!). Customer has asked for a ledge/shelf or window seat to be installed in the bathroom. This is our rough mock-up of a ledge that should work for her - fits in the space and it is high enough to accomodate the baseboard! Customer is coming back next week (Saturday) to pick up the house. So early next week will be spent installing the floors and late next week will be finishing up the trim work (baseboards, crown molding, window and door trims, and chair rails where appropriate)! Then it's on to a little green house for wallpapering, a pink house for cleaning, and a blue Holly Hobby house for wallpapers and some construction alterations (putting on a back roof with hinge and chimney)! Plus, there is always my friend's/customer's Real Good Toy's kit (Contemporary Ranch) that I'm working on - the glass wall in it will be so much fun to make! 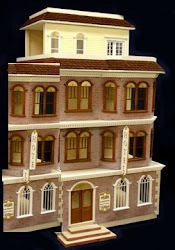 Quickly using Paint I copied and pasted my "addition" to the other side of the Darlington Hotel dollhouse. Someday I will complete this project of mine. In the meantime, I'm working on a bunch of other stuff too! 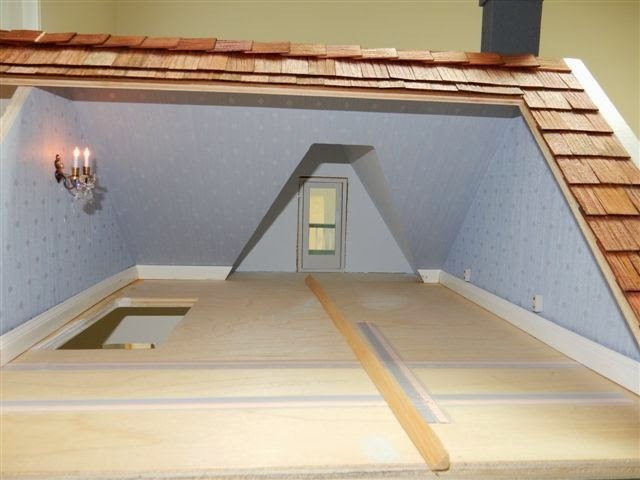 I am a woman in her 40s who loves to play with dollhouses to the point of obsession. Luckily I have a husband of 21-years who tolerates it, three young daughters (14, 13, and 10) who play with me, and parents who encourage my passion (aka obsession)! I own a miniature shop in VA (along with my business partner who is also my mother). I am addicted to coffee and chocolate. That's me in a nutshell.